We nearly moved to Jacksonville, Florida for my mom’s job in 2001. We house-hunted and explored the Jax area. My mom cautioned us about “gators” though I don’t think I really paid her any mind. Until. We ended up along a swampy area of one of the many lakes. We needed a pit stop so parked and strolled to the nearby public facility. Without warning, the bark of a small dog began in earnest. Barking. Snarling. Barking. All in the span of about 30 seconds. Yes, the dog had our attention. We all looked at each other because it was evident something serious was occurring though we were unable to see the dog. Just as suddenly as the bark began, a crazy commotion occurred including lots of swishing and splashing water, and then, complete silence. Alligator or not, we were believers. We hadn’t anticipated time to swim but my parents worked it into the schedule. We stopped at a swim shop to buy gear and off we went. We arrived at a lovely beach, hopped in the water, attempted to surf, swam around and finally were worn out. As we were walking back to dry land, we realized my brother’s new, yellow swim trunks were see-through. Uh, yeah, kind of not cool for a sister to notice that! Our time at the beach on this job-related trip was short lived. We then headed to Saint Augustine, Florida, the oldest city in the US. The stand-out for St. Augustine were the Spanish colonial architecture in the old town area, Cathedral Basilica of St. Augustine, and the beautiful, lush flora that lined the divided streets, yards, and green spaces. I don’t remember a lot as I was 12 at the time but the shade from the enormous trees and the street vendors are standouts. 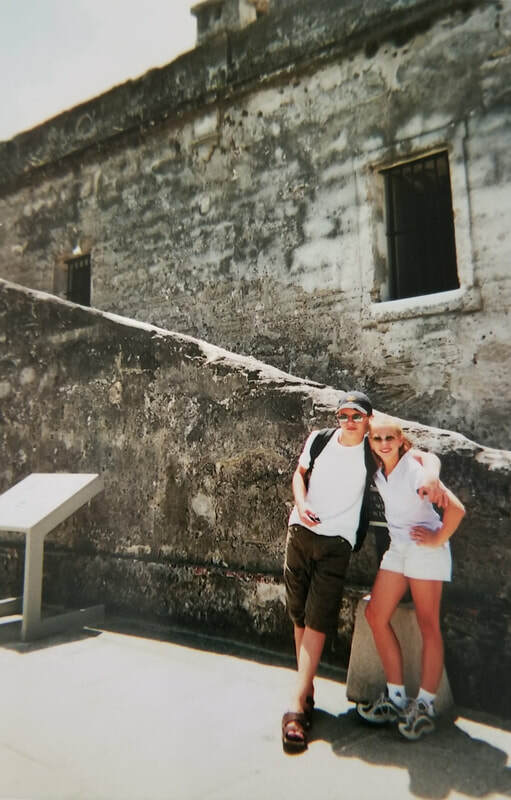 Always seeking historical relevance, we visited Castillo de San Marcos. The stone fortress was built by the Spanish Empire in the 1600s, however it was controlled by both the Spanish and the British before becoming the property of the United States when we gained Florida in 1821. Truly, all I can recall of the fortress was that it was really cool and I looked super good in my Gap outfit and green sunglasses. My dad and brother are divers so naturally had to carve some dive time into one of our beach trips. While at Shell Island, Mom and I beach-combed with the guys off in the distance. The water was murky and the shells weren’t as plentiful as we’d hoped. The big news from this excursion was the “shark encounter” Dad and my brother had. The churn in the water reduced visibility but all in all their dive was going well until something large and grey circled them. Then it began bumping them. To their surprise (and relief), it was a dolphin.